A lot of us enjoy the satisfying sensation of a good “retail therapy” session. But the moment gets ruined when we’re ready to leave the shop with our purchases, only to hit a roadblock—the payment process. Malaysian consumers have already voiced their confidence in going cashless, but some merchants have yet to take the right steps towards this same vision. It’s 2018 and merchants are expected to keep up with the advancements of commerce, but we consumers are still faced with these 8 scenarios. I personally hope to see these lessen in the coming years. 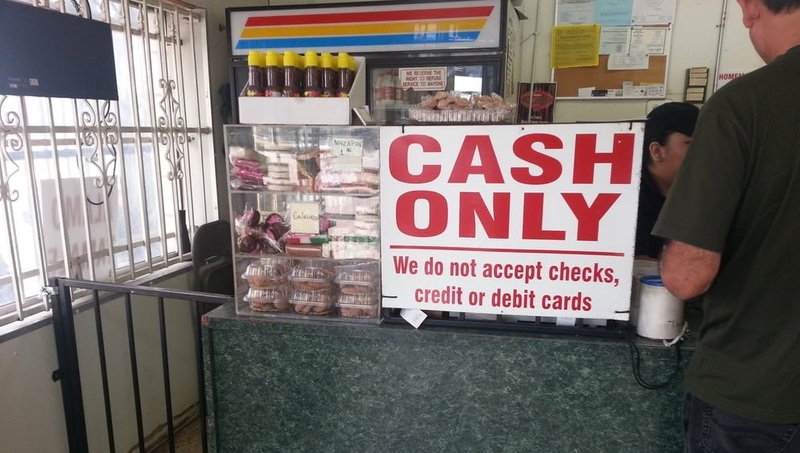 For consumers, seeing the “only cash” signboard at the cashier can affect a customer’s decision on whether they frequent a restaurant or shop. We understand that not every business can do much because they may not be properly established (i.e hawker stalls, roadside stalls), but technology is advancing to the point where such services can be offered and set up at no cost to the merchant or consumer. Back in November 2017, a Facebook post by user Ikram Zidane went viral when he shared a screenshot of a conversation he had with Bank Negara Malaysia (BNM). 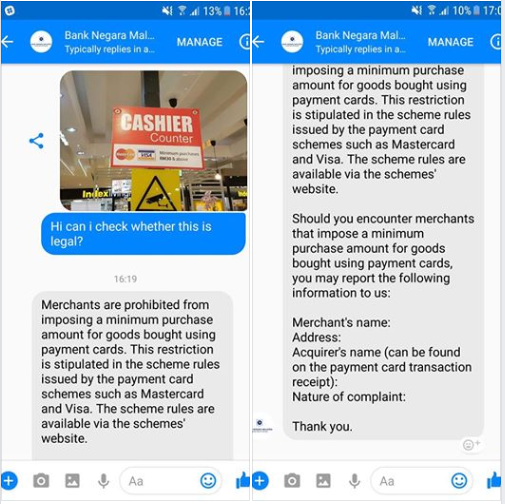 They mentioned that merchants are prohibited from imposing a minimum purchase for goods bought using payment cards, which is a great rule when moving to a true cashless society. Fast forward to 2018 and some merchants still feel burdened by the transaction fees for credit card payments, especially when the purchase itself is menial. Other institutions also see this as a pain point and are working to help remove this unnecessary strain on customers to reach that minimum amount if they want to pay with their card. Am I the only who despises having coins around? To me, they serve very little purpose and I can’t wait for the day when my great grandchildren will show me a 50 cents coin and claim it as an antique. So every chance I get, I pass the small change to the merchants. But not every Malaysian shares this same habit, which results in a lot of merchants often finding themselves short of small change. Thus customers often find themselves in situations where the merchants will have to excuse themselves while they scurry off to neighbouring stores get change, which honestly, is a waste of time for everyone. Similar to an earlier point, some merchants charge an additional 2% to the bill when purchases are made using a debit or credit card, essentially to cover the cost of the card transaction fee. This shouldn’t be an issue anymore though as BNM has announced that retailers are not allowed to impose surcharges for payments using debit and credit cards. So to retail business owners, I hope this gives you an idea of what things can look like from the other side. These “complaints” may seem menial at first, but as it piles up, it can really ruin my shopping sessions. I’m more than happy to revisit your store if given the right experience, and one way that can be done is how I can pay you. Living in the 21st century, most of us consumers now even leave our wallets at home and walk out with just our phones, so having an option to pay by just scanning a QR code sounds more appealing than needing to wait for you to give us small change (especially coins). To switch up your business to align with this, one option you can look at is Maybank and their recent feature known as Maybank QRPayBiz; a system that allows businesses to process payments directly via QR codes on the app. You won’t need to pay any fees to set up an account and for now, there aren’t any transaction fees imposed on any party. There are no issues with cashflow because the payments are directly made to your bank accounts. The registration isn’t complicated, you can instantly register via the Maybank QRPayBiz app that’s available in 3 languages and there is no documentation required. If you manage to invite your friends who also run businesses to sign up as a Maybank QRPay merchant, you can earn RM100 with each successful referral (so long as you receive a minimum amount of 5 Maybank QRPay transactions with accumulated value of RM100). It’s a pretty win-win situation for all since you get access to millions of ready customers (any Maybank account holder can make use of Maybank QRPay) while we get a better experience by being able to pay faster with no worries. 2019’s coming, not too late to jump on that cashless bandwagon with this small change that can benefit everyone at no cost. For more information on Maybank QRPayBiz app, you can check out the official website here. You can also download the app via the links for Android and iOS here. This article is written in collaboration with Maybank.